Objective: Work closely with customer’s designer to recreate a kitchen using ecological and sustainable materials in a very traditional style. Results: The designer was able to honor the owners' aesthetic style and strong environmental ethic while creating their perfect kitchen. We employed only sustainable materials and products including Vetrazzo countertops, cork flooring, and locally crafted cabinets using FSC wood and water-based stain and lacquer. 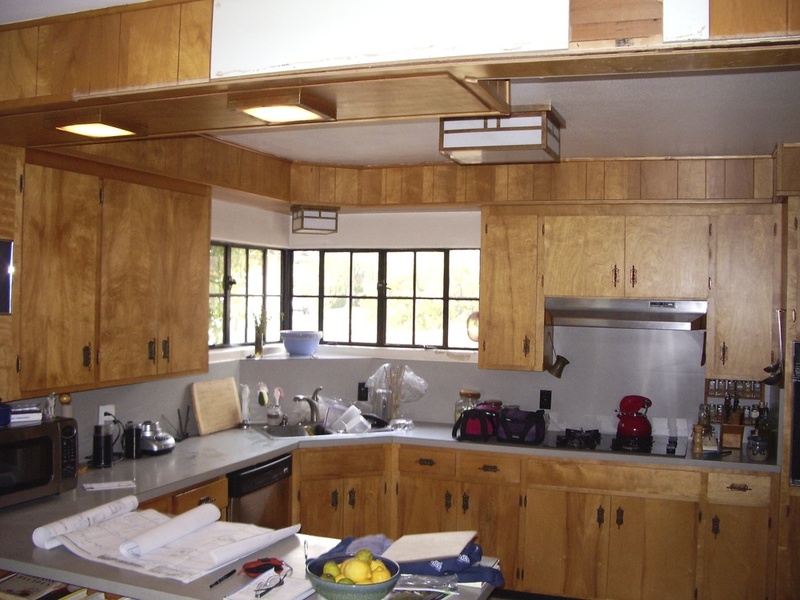 Energy saving features such as blown-in blanket cellulose insulation, new low-E windows, and LED recessed lights resulted in a beautiful, functional, and environmentally sound kitchen. After: New cabinets with shaker style doors and details. Before: Old steel windows, formica countertops, vinyl flooring. After: Tile, Vetrazzo and beautiful cabinets. After: Same corner from different angle. Island table and all custom cabinetry by Artistic Freedom Designs of Vista, CA. After: New mantle and art shelves to replace painted mantle and log storage.